The cancer and allergy cases are skyrocketing and mainly it’s because of what we eat and what we breathe. In now days we have the ability to find natural and locally grown food, but what about our houses and the air we breathe. Right now everyone is concern about asbestos and lead paint. It took many years to find the link between those products and the cancer, but how many things we don’t know that impacting our health today. Do you know what your furniture is made of? Most of us would say yes it’s made from wood and that would be wrong answer. Most of the furniture is made from pressed wood products like plywood, particle boards, and fiber boards. All those products contain formaldehyde in the glue and are toxic. Formaldehyde, a colorless, pungent-smelling gas, can cause watery eyes, burning sensations in the eyes and throat, nausea, and difficulty in breathing in some humans exposed at elevated levels (above 0.1 parts per million). High concentrations may trigger attacks in people with asthma. There is evidence that some people can develop a sensitivity to formaldehyde. It has also been shown to cause cancer in animals and may cause cancer in humans. Health effects include eye, nose, and throat irritation; wheezing and coughing; fatigue; skin rash; severe allergic reactions. Most of the wooden sheds are made from OSB sheets and T1-11 siding and both of them are pressed wood products with high concentrations of formaldehyde. Yes if you not going to spend a lot of time inside the shed it might not affect you that much, but to protect yourself and your loved ones we are always recommending the go with natural materials. In 2004 the International Agency for the Research on Cancer, a division of the World Health Organization, classified formaldehyde as a carcinogen, a conclusion shared by the Environmental Protection Agency. In September 2007, formaldehyde use as a preservative and in many other applications, was completely banned in Europe, and a strict standard- known as the E1 standard- was set for its presence in building materials. The European standard for formaldehyde emission from building materials is .14ppm (parts per million.) Beginning January 1st 2009 the state of California's Air Resource Board (CARB) will institute new state standards for allowable emissions from composite wood products which will be on a par with the toughest international standards. As California's economy is the 5th largest in the world, the upcoming standards will soon force the rest of the domestic industry to comply with these standards. Plywood emissions vary greatly. 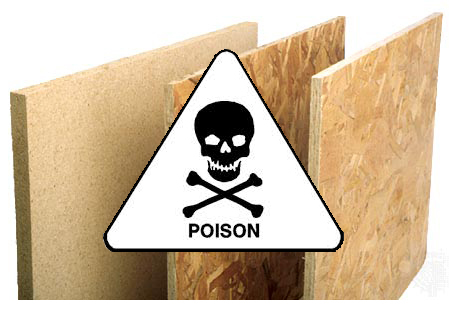 Chinese plywood has been shown to have among the highest levels of formaldehyde emissions. An L.A. Times article (10/8/2006) stated that half a billion dollars of plywood was imported from China in 2005. One product from Home Depot tested at 100x the allowable levels in Japan and 30x the allowable levels in Europe. But for most people shopping for sheds, this issue will never be raised. And whether they end up buying the cheapest or most expensive sheds, the wood products used will most likely contain high levels of known harmful chemicals that will soon be banned in the U.S.